By dr. dolittle on June 20, 2017. Most of us have heard the phrase: Laughter is contagious. When we hear other people laughing, we often smile even if we have no idea why they are laughing. Dr. Sophie Scott from the University College of London and her colleagues played both positive sounds (like laughter) and negative sounds (like retching or screaming) to subjects and found the sounds activated the premotor cortical region of the brain. This area of the brain is responsible for preparing facial muscles to respond to sounds. In fact, the subjects tended to smile in response to hearing laughter and responses were higher for the positive sounds which led the team to suspect that positive sounds may be more contagious than negative sounds. According to Dr. Scott, laughter may have been a precursor to spoken language suggesting that positive emotions may be important to social interactions and building bonds. Sharing emotional states in such a manner helps us connect with others in a group. 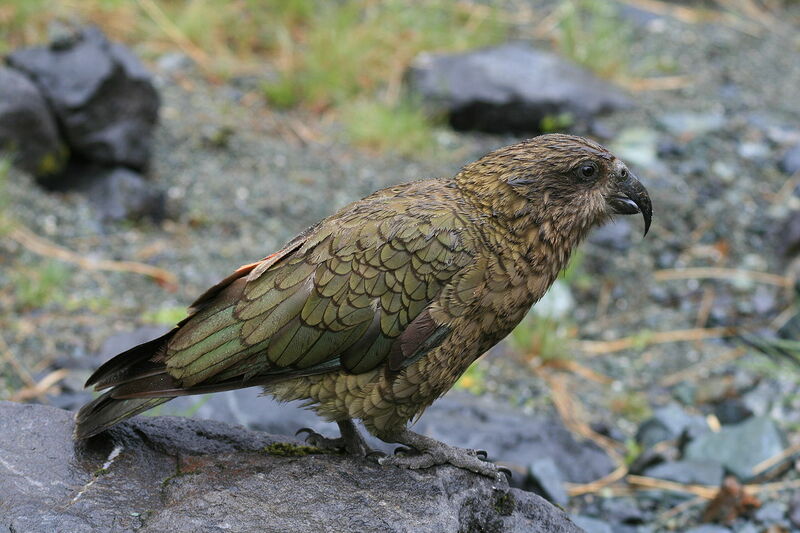 New research has discovered that New Zealand keas (Nestor notabilis; photo above) also exhibit signs of contagious positive emotions. These birds are quite playful and have vocalizations that are distinct when they are playing. In a recent study published in Current Biology, researchers played back various types of calls to wild keas. What they found was that the play-related vocalizations actually increased number of times both juvenile and adult birds exhibited play behavior and the length of time the birds played. R Schwing, XJ Nelson, A Wein, S Parsons. Positive emotional contagion in a New Zealand parrot. Current Biology. 27(6): R213–R214, 2017.